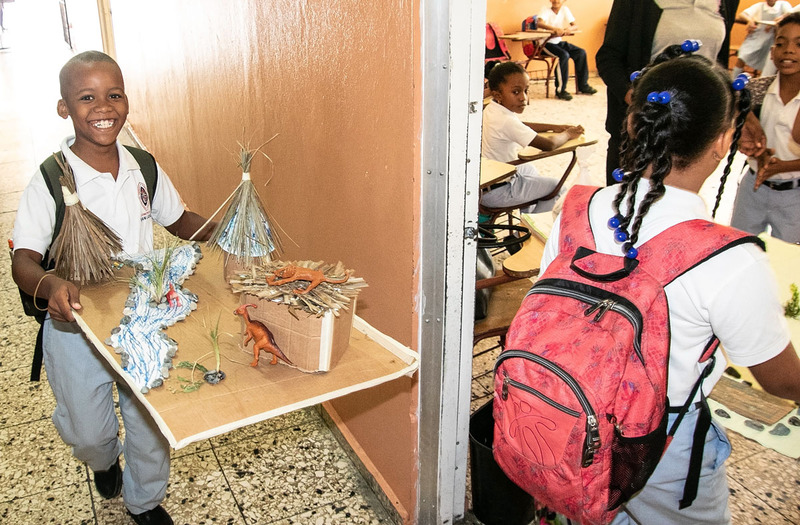 A fourth-grader entering a classroom with his class project at Colegio Episcopal San José in Boca Chica, one of the 26 Episcopal schools in the Dominican Republic. A three-panel brochure on this scholarship program is available here. A society rests on an educational foundation; educating informed, ethical citizens might be THE essential ingredient to improving the quality of life for individuals and families. The great majority of Dominicans have achieved basic literacy. The Episcopal parochial schools (in Spanish, “colegios”) have contributed greatly to this success story. Still, the population needs to move beyond basic literacy skills for the economy to grow and the standard of living for all Dominicans to continue to improve.The DDG was formed to help the Dominican Episcopal Diocese become self-sustainable and supports the ministries through which the Diocese serves its congregations. This scholarship program is just one example of that support. School attendance is mandatory in the DR through the 8th grade. In recent years, the government has invested relatively large amounts of money to build education facilities and encourage families to enroll their children in school, whether public “escuelas” or private “colegios.” While parents are willing, their pocketbooks can be weak. Economic hardship can prevent children from meeting the attendance standard; parents needing to “put food on the table” sometimes cannot afford the cost of enrollment fees, school uniforms and books. Long before the government’s push for educational achievement, the Dominican Episcopal Church has made education and health ministries its priority; Bishop Moisés Quezada Mota has repeatedly emphasized educational improvement at Diocesan conventions and gatherings. For over 100 years the Dominican Episcopal Church has been nourishing the minds and spirits of Dominican youth. The Diocese currently operates 26 schools (whether nursery schools, primary schools, pre-K to 8 or pre-K to 12) that serve approximately 6,400 students. Over the past 3 years, major initiatives have been launched to improve facilities, update programs, meet new government standards and offer professional development activities to teachers. Students at an assembly in Colegio Episcopal San Andrés in Santo Domingo. The Episcopal schools in the DR have a well-deserved reputation for serving segments of the population most in need. A number of these schools rank among the finest schools in the nation. Many children’s lives have been transformed by an Episcopal education like the one provided by Colegio Episcopal Todos Los Santos in La Romana. For example, a lawyer, her chemistry professor brother and their oldest sibling, an Army Colonel, spent childhoods in a “house” without running water or a paved floor. Their futures “took off” after graduation from an Episcopal high school, a school they would not have been able to attend without support from funding sources like the DDG Scholarship Program. Episcopal schools must be self-supporting because the diocese does not have a general revenue fund sufficient to operate a sizable school system. As a result, schools depend upon student tuition to cover their expenses. The diocese remains committed to providing an education to young people, regardless of their ability to pay or religious affiliation. The Diocese continues to insist that informed, ethical, motivated young citizens are the key to the future of the Dominican Republic. A scholarship program supported by individuals, organizations and churches in the United States has and will continue to provide the opportunity these students need to attend an Episcopal school. Your support will also help to improve the quality of educational programs that scholarship students receive. Historically, approximately 700 students have received financial assistance from sponsors in the USA each year. A scholarship “costs” US$350 a year. Experience has taught us that parents must make an investment in their child’s education in order to ensure parental involvement. Parents pay a portion of the tuition and/or volunteer in the school as a result. A Diocesan committee determines the number of scholarships that a school may receive. Then, school administrators, typically with teacher input, identify those students most likely to benefit to receive scholarships. Depending on available resources, a scholarship might be split to provide partial support to deserving youngsters. Scholarships are awarded based on a family’s ability to pay, student attendance records, and academic achievement from previous years. The children enrolled in the K-8 Episcopal school in Jarabacoa. Give thoughts and prayers to determining an appropriate amount you would like to donate, then send your check to this address: The Dominican Development Group (DDG), P.O. Box 272261, Tampa, FL 33688. Make out your check to the “Dominican Development Group,” and please note “Scholarship Fund” on your check. To make donations using PAYPAL, please go to the DDG’s webpage for donations here and note “Scholarship Fund” in the comments field. If you have questions about the DDG’s scholarship program or the Dominican Episcopal schools, please contact Dr. Thomas McGowan at email <tmcgowan1948@gmail.com>. Dr. McGowan is an emeritus Professor of Teaching, Learning, and Teacher Education at the University of Nebraska – Lincoln, and is also an accredited missionary of The Episcopal Church and a ​member of the DDG’s Board of Directors. He serves as a volunteer consultant to the leadership of the Dominican Episcopal schools and conducts frequent workshops for their administrators and teachers. To check out his lively blog about his educational consultant work in the Dominican Republic, click here. The DDG forwards 100% of all scholarship contributions directly to the Dominican Diocesan Office, and then a Diocesan committee and local educators convert your dollars into academic support for needy, high-achieving young people. The DDG is recognized by the Internal Revenue Service as a 501c3 non-profit organization, and contributions to the DDG are tax-deductible in accordance with the Internal Revenue Code (Title 26 of the United States Code). Please consult your financial advisor to see if your donation will qualify for a tax deduction.